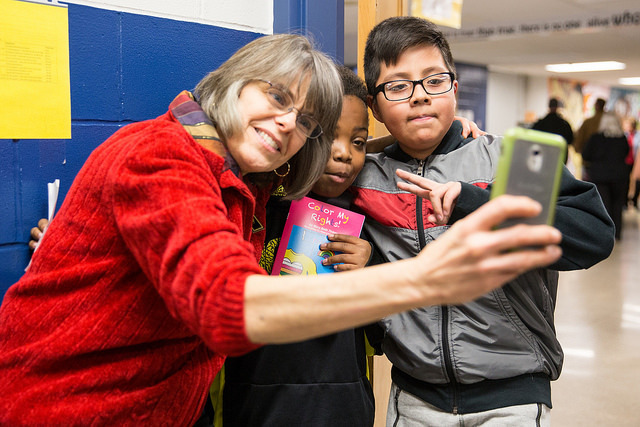 Mary Beth Tinker takes a selfie with students during a stop at Cattell Elementary School. They’re baaack! And to commemorate the 50th anniversary this week of their historic and principled stand against the Viet Nam War, John and Mary Beth Tinker have made the rounds of the school district they fought all the way to the Supreme Court before finally prevailing and establishing a landmark precedent of student rights. On Monday they toured the elementary schools that serve the Northside neighborhood where they lived in 1965 when it all began. Mary Beth was in junior high at Harding and John was in high school at North when they were suspended for violating a hastily contrived prohibition of armbands designed to head off the silent protest high school principals got wind of just before it happened. Ironically, the loophole in the ban was that it did not extend to elementary schools. So the younger Tinker siblings (Hope in 5th grade at Madison and Paul in 2nd grade at Cattell) suffered no consequences for the black armbands they wore to school in solidarity with their older sister and brother. At Cattell on Monday afternoon the mood was celebratory as the 5th graders and a trio of Tinkers (all except John) sang the school song. Souvenir replica armbands were much in demand. But the scene was rewound 50 years by genuine artifacts the Tinkers brought along for a poignant round of show and tell. Mary Beth produced the actual pink pass she was given by her math teacher when she arrived at class on December 16th, 1965, the one that sent her to the office where she was suspended despite agreeing at that point to remove her armband. Paul showed the students one piece of the hate mail the family received. Hope recalled someone on the radio putting a bounty on their father. But the session ended on an upbeat note with another unison song: This Little Light of Mine. Tuesday was spent at Roosevelt High School. After a full day of assorted interactions with students in classes and at performances by fine arts ensembles it was time for the keynote event of the week: The first in a series of public events called the Teddy Talks under the auspices of the Roosevelt Foundation and Alumni Association. Following some spoken word poetry by Roosevelt students in keeping with a civic spirit of conscientious objection there were opening remarks by Mary Beth Tinker. But the highlight of the evening was a panel discussion that included not only the two Tinker plaintiffs in the landmark case that became an enduring American legal precedent but the lawyer, Dan Johnston, who represented them, among others. One of the panelists, Roosevelt senior Sulaiman Muhammad, was also one of the poets who began the event. There were current school board members in the audience sporting armbands like fans at a game in their favorite team’s gear and the net effect of the reaffirmation of student rights was like an aeronautics time lapse from the Wright brothers to the breaking of the sound barrier. Wednesday’s itinerary called for a full day back at Harding Middle School where Mary Beth was a student when she was suspended for wearing an armband to class. In between grade-level assemblies she posed next to locker #319, the one where she used to stow her coat and books that’s now been turned into a shrine in her name. At lunchtime she and Hope and John mingled with student government leaders and they all broke bread together in the teacher’s lounge, casually chatting and discovering all that they have in common. It was like watching the past and the future rendezvous for lunch in the present. Afterwards it was back to the auditorium where current and former Harding students performed spoken word poetry for their guests of honor. The day also included viewings of murals in the Harding courtyard and artwork produced by the school’s popular Hip Hop: Rhetoric and Rhyme class, the cradle of the district’s burgeoning Movement 515 fine arts program. If Tuesday evening’s public event at Roosevelt was the centerpiece of the Tinkers’ homecoming week, Thursday and Friday morning drop-ins at the Central Campus Urban Leadership program were the perfect culmination. Students were presenting their Black Lives Matter unit projects. There could not have been a more vivid demonstration of the Tinker legacy to students in DMPS and across the country than the powerful work that was on display in a classroom where students are encouraged and empowered to determine exactly the right word(s) and allowed to use them, whatever they are. From elementary on Monday to high school by week’s end, the Tinkers made the rounds like tribal elders returning from a long journey to meet a new generation of descendants. Mary Beth took pictures while the UL students presented and shook their hands when they were finished. She even joined in during the feedback, telling one group of three that their work was “powerful” and thanking them for it. What if the school board hadn’t overreacted to a handful of committed students who wanted to make a silent but sincere statement 50 years ago? “I wouldn’t be here today,” said Mary Beth on Thursday morning. What a shame that would have been. She and her brother wouldn’t have had the chance to see the looks on the faces of so many students when they opened the gift given to them by the Tinkers, Christopher Eckhardt, Bruce Clark and the rest of their courageous friends.